The Chicco TravelSeat is the perfect travel highchair to fit your busy lifestyle. 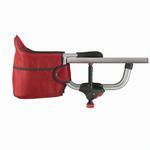 The TravelSeat folds compactly and comes with a trendy carrybag. Its fashionable, Italian-woven fabric seat can be removed and machine-washed to keep your Chicco TravelSeat looking sharp. 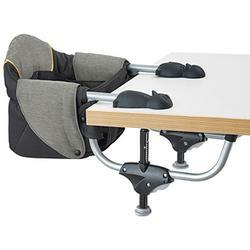 Its three-point safety harness and quick-grip table clamping will leave you with no worries about your child's safety. This travel seat will fit any tabletop with a table skirt up to six inches thick, so you can use your seat almost anywhere.